After Husband and I had been blessed (some days more blessed than others) with three kids, we wanted to take a permanent step to ensure we wouldn't be unexpectedly blessed again. I knew that this medical procedure would be up to me to handle. I can't even get Husband to go to the dentist regularly, let alone a doctor who would be asking him to drop his drawers. I know I have some younger readers of this blog, so take note ladies: Do not let your reproductive future hinge on a medical procedure to be scheduled by a man who is afraid to even get his teeth cleaned. The only way I get Husband to visit his dentist is to threaten to cut him off my corporate dental plan. It works like a charm--because he knows I would do it in a heartbeat. Tough love. Husband and I each go to different dentists but they are both so experienced and well-established that they probably had Civil War veterans among their early patients. 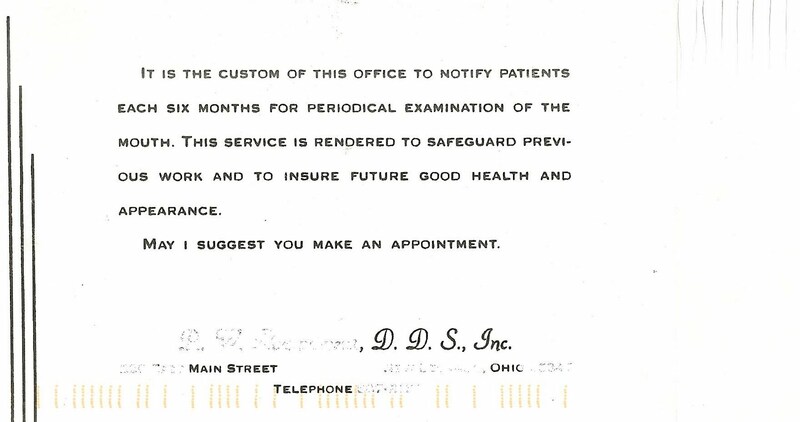 Husband's dentist is so cute and quaint that he sends this little postcard every six months, inviting him to come in for a periodical examination of the mouth. I like to imagine that he personally oversaw the typesetting of this postcard, which he printed in such vast quantities back in 1922 that he still has them to send out today. The address side is hand-typed. On a typewriter. So cute. After receiving this postcard, how could you NOT hitch up your carriage and set off across the prairie to insure future good health and appearance. Husband and I love our hometown dentists and family doctor, however, I am thankful for the extremely modern docs who fixed me laparoscopically. We were a little disappointed, though, when they wouldn't accept two hens and a rooster as our co-pay.